We love a gimmick here at Calendar Lady Promotions and our Custom CD calendar is a CD case style pop-up calendar that will sit on your desk-top and display your business details and logo. So why not give them away to your customers and enjoy your business advert on someone elses desk. 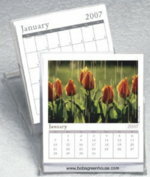 Lots more calendars besides our Custom CD calendar click here. To find out more about our Custom CD calendar click here and fill in the contact form and we'll get straight back to you. We have lots more promotional and personalised items here at Calendar Lady Promotions besides our Custom CD calendar click here for our full A-Z list.